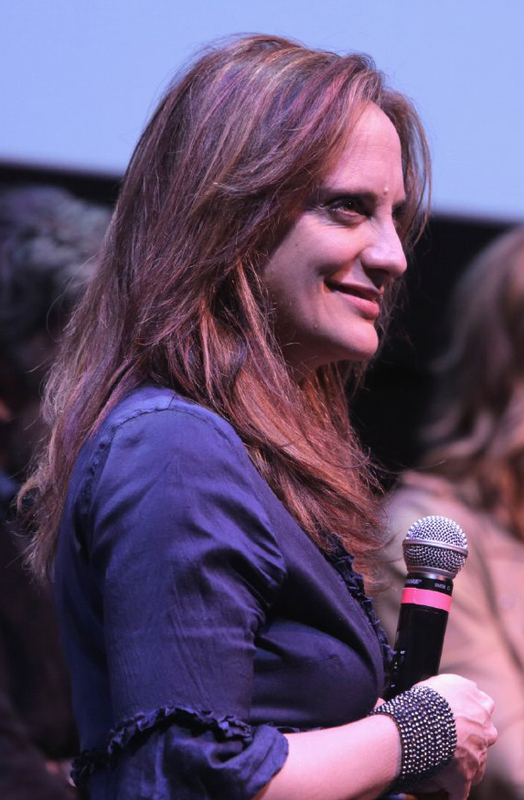 TAKE CARE is a fine title for the new romantic comedy and first full-length film from Liz Tuccillo (shown below) because it works two ways. This simple phrase is what you tell people you care about just before you or they depart, as a reminder, in fact, that you do care about them. It is also, in this case, about literally taking care: of people, of relationships, of someone who's unable to take proper care of herself. That would be Frannie, who, when we meet her, has just arrived home from the hospital, sporting a broken leg (in a cast) and arm (in a sling), after being hit by a car. In tow are her sister and best friend, both of whom say they are ready to care for her but in reality are not. Frannie -- played by Leslie Bibb (below) in her best adorable-without-curdling-the-milk manner -- is certain she can care for herself, at least until the home-health-aid arrives tomorrow, or maybe Monday. It does not take long for Frannie to realize that this is not the case. In a screenplay marked by how cleverly and organically writer/director Tuccillo (pronounced two-chill-oh, with the accent on the second syllable) manages the exposition, we slowly learn all about Frannie and her life up to now: the ex-boyfriend she nursed through his bout with colon cancer (more caretaking! ), her job, her friends, her problems and bad habits. One of the joys of this movie is how its lead characters are shown us, warts and all, and how we come to love' em all the same. 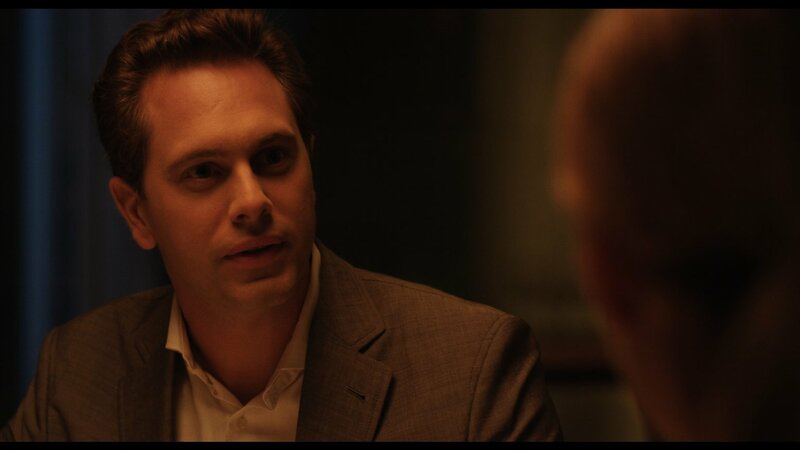 This goes for Frannie's soon-to-be caretaker, played equally well by a fellow we can't see too much of: Thomas Sadoski (above), who turns his character of Devon, like several other characters here, into someone who grows and changes during the course of the movie. This splendid growth and change happens to some of the subsidiary characters, too: particularly the next-door neighbor of Frannie (Michael Stahl-David, above), who must help carry Frannie up to her fourth-floor apartment, as well as Jodi, Devon's current girlfriend (played with tremendous charm, humor and trepidation by Betty Gilpin). The filmmaker's plotting uses necessity as much as desire as the motor that drives the movie, and this, too, is a big plus. 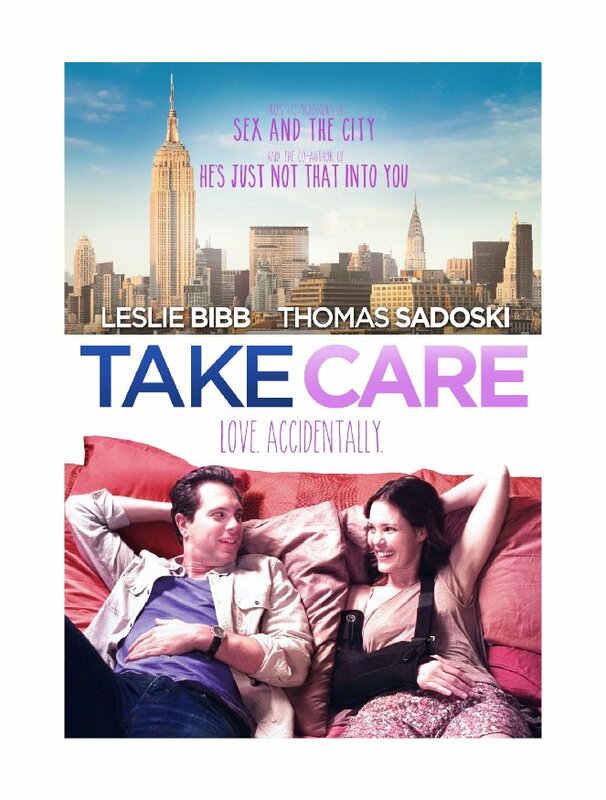 Basically, what makes Take Care work so well, once the plot is in place, are the two lead performances from Bibb and Sadoski. These two play off each other beautifully -- she, upfront and in your (and his) face; he, standing back and trying to figure out what he's doing and why. The movie also tackles the question of guilt and the shame of being dangerously ill and having to be cared for, and the consequent anger this produces. There's a great deal going on here for such a bouncy, energetic rom-com. Ms Tuccillo clearly has a lot on her mind and the talent to bring it to life. Can't wait to see what she'll tackle next. Meanwhile, Take Care -- from EntertainmentOne and running 94 minutes -- opens this Friday, December 5, in New York City at the Cinema Village. Elsewhere ? I sure hope so. But in any case, the movie will simultaneously open on VOD platforms nationwide, so wherever you happen to live, you can undoubtedly catch it. 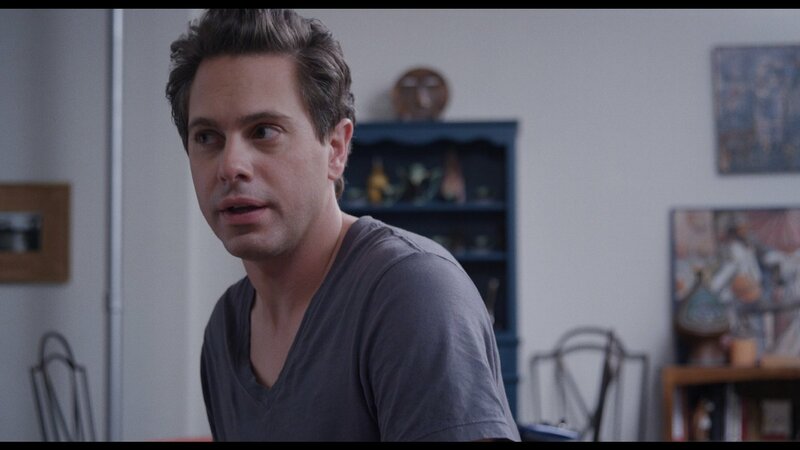 TrustMovies had time for a short phone interview with the writer/director of Take Care, Liz Tuccillo this week, during which he asked her a few questions of interest (to him, at least). Liz was charming and helpful and forthcoming (with almost everything), and you can peruse the Q&A below. As there could be spoilers ahead (and one comment that Ms Tuccillo feels could change the way you look at the film), so maybe see it first and then come back here to read the interview. TM: This is the first full-length movie that you’ve written and directed? How long had this been in the planning/ execution stages? For an indie film it was probably quicker than usual. About two years. I had to start really doing my research to find the very specific actors I needed: actors that were known, so that they would have audience appeal, but not so famous that they’d think you were crazy to ask them to do this small indie film. It was difficult for me because I had such specific tastes. It’s hard to find someone beautiful, funny, real, and who can do pratfalls, too. But Leslie Bibb is so disciplined and serious and, oh, boy, she studies a lot. She really works on a script! I love her work, too. She’s an actress who can take “cute” and get really close to being too cutesy, and yet never go over the top. That’s quite a skill. And Tom Sadoski proves more than her match. It’s so good to see him in a role like this! He should still be seen in larger and more important roles! Somebody ought to write a script in which he plays Mark Ruffalo’s younger brother. Exactly. I’m really happy that these two did this with film with me. Did you always plan to make a movie – a rom-com, at that – in which there were no villains? You end up caring about all the characters, from his girlfriend to her next-door neightbor. Which is wonderful. This was really a goal of mine, and I am so happy to hear you say this, because it means that you got it. That’s great to hear. The other thing I wanted to talk about is the fact that, in your film, the people actually change – in ways that seem important and believable – in the course of the movie. This, too, sets it apart. Both characters have stuff they really need to learn, and you’ve found a way to let them do this believably, while entertaining us royally. I just really wanted it to be believable to make everybody behave in a way that seems credible. And when that happens, and if you follow that idea, chances are people will wind up changing. Well, this does not happen in that many rom-coms, where instead, it’s all about how the girl or the guy ends up getting what they want, which is the other girl or guy. That’s true. But did you see My Best Friend’s Wedding – that doesn’t happen there! Exactly, and that’s why that movie is so terrific. What was the budget for your film? Oh, sorry -- I’m not at liberty to talk about that. Whoops -- is that fairly usual? Well, let see if we can approach this subject a little differently, then: Did this movie come in at pretty much what you were expecting it to cost? Well, yes, but then there were the costs, post-production, and even post-post-production, that we didn’t so much expect. What would you have done differently now, if you were to tackle this all again? Where do I begin?! Let’s see: My DP strongly suggested we paint the walls – because they were bright white. But because the apartment we shot in was my best friend’s apartment, I said, Oh, no, we can’t do that! Now, I watch the movie and all I see are these bright white walls! That’s something to watch out for, huh? Don’t have bright white walls. Definitely. Oh, but now, people will read this and then, when they see the movie, all they’ll notice are the walls! Nah. Your movie's too entertaining for that. Anyway, I’ll place the interview after my review, and warn readers to see the movie first, and then read the interview, in case there are spoilers.